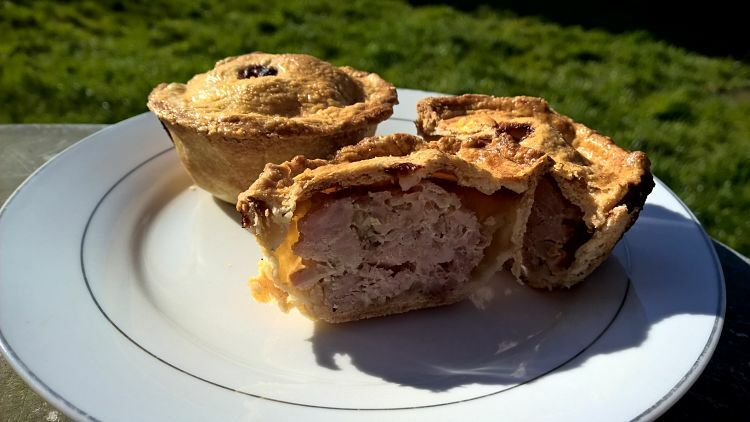 Pork pies are traditional British fare. I’m not sure how well known they are outside of the UK, so for those who don’t know, they are not a saucy pie, they are firm, and are almost always eaten cold. They’re a popular picnic food as they’re easy to just grab and eat with your hand. They are made with a hot water crust pastry which goes against everything you’ve ever learned about making pastry. Anyway, shall I get on with it? The reason I’ve described those three ingredients as optional is that they create the jelly that you get in between the meat and the pastry. Now until I made pork pies myself for the first time several months back, I had no idea that the jelly was actually made deliberately, I thought it was just something that happened during cooking. So that time I made the jelly. This time, I was going to make the jelly but it wasn’t until I got to that stage that I discovered I had no gelatine leaves left. So I just left that stage out, and that works just fine too, it’s just that you get a gap between the meat and pastry. Not everybody likes that jelly anyway, so it’s optional as far as I’m concerned. 1. Heat your oven to 190ºC/370F. Have ready a 12-hole muffin tin. 2. First make the pork filling. Put the onion, pork, bacon and parsley into a bowl with some salt and pepper and mix well. Paul says that to check the seasoning of the mix, fry a tiny nugget of the mixture in a frying pan until cooked through. Leave to cool, then taste and add more seasoning if necessary. I didn’t bother with that, I just guessed (sorry Paul! ), and it was fine, go easy on the salt because remember the bacon is salty anyway. Cover and set aside while you make the pastry. 3. For the hot water crust, put the flours into a bowl. Add the butter and rub in with your fingertips. Heat the lard in a pan until melted. Dissolve the salt in the boiling water, then add to the melted lard. Pour this liquid into the flour. Mix with a spoon then, as soon as it is cool enough, tip the dough onto a lightly floured surface and work together into a ball. Careful, it may still be hot. Once the dough ball is formed, divide the dough in two, one piece roughly two thirds, and the other piece one third. 4. Working as quickly as you can, roll out the larger piece of dough to about a 3mm thickness; it should be glossy and still warm to touch. Using an 11-12cm cutter, cut out 12 rounds to line the muffin moulds. Put them into the moulds, shaping to fit the sides. The pastry should come slightly above the rim of each mould. If you make a hole in it, just patch it up with another bit of pastry. Hot water crust is a very forgiving pastry as long as you work quickly before it gets cold. Roll out the other piece of dough and use a 6-7cm cutter to cut out 12 lids. Lift away the trimmings and re-roll the pastry if you need to cut more, but only once. As it cools, it stiffens and becomes more brittle. 5. Divide the pork mixture amongst the 12 pastry cases, press it down a little to make it fit in. Brush the pastry case rims with beaten egg and place the lids on top. Crimp the edges together well to seal. Use a chopstick or something similar to make a good-sized hole, about 5mm in diameter, in the middle of each pie lid. Brush the pastry lids with beaten egg . Bake the pies for 50 minutes until golden brown. 6. If you’re making the optional jelly, then near the end of the pie cooking time, soften the gelatine in cold water to cover for 5 minutes or so. In a jug, dissolve the chicken stock cube in the boiling water. Drain the gelatine and squeeze to remove excess liquid, then add the gelatine to the stock and stir until completely dissolved. 7. When the pies come out of the oven, enlarge the holes in the top if necessary, then carefully pour in a little of the gelatine mixture into each one. I found when I did this, I needed to go round a few times to allow the liquid to spread through before being able to fit more in. You should be able to use up all of that liquid amongst the pies, even though it seems too much. Leave the pies to cool and settle overnight before serving. Or, cool on the counter and then chill for 2 hours. Thanks for your pork pie recipe Paul! No problem Vanessa, if you’d like me to come round and give you a personal baking lesson anytime, just let me know. That would be great, thanks Paul! Funnily enough, my daughter doesn’t like pork very much, and she asked me if I could have a go at making these with chicken instead next time, so I think we’ll just go ahead with that, I’m sure Paul won’t mind. I’m terribly sorry, I made them last Saturday and they’re all gone now! I’ll save you one next time. These look delicious. If I eat them, will I get eyes as arresting as Paul’s? That would be a lovely side effect. Yep, I’m pretty sure those enticing blue eyes are down to all the baking, and eating of course. Ah yes, the old pork pie hats! Hey, less of the Paul thing please!! Great pies though, made by Vanessa, not you Paul, she’s just fine as she is, she doesn’t need you in her kitchen …. Just trying to brush up my skills is all! Hmm, hard to decide which one looks more tasty – Paul or the pork pie. No need to choose, we can just appreciate them both!